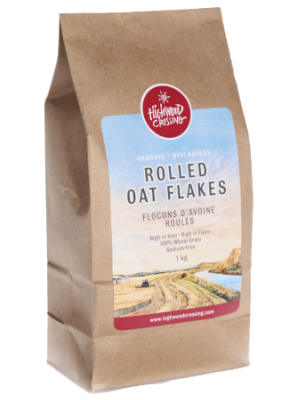 Highwood Crossing Organic Muesli is a raw nutritious whole grain cereal that is the perfect base for your favourite combination of fruit, nuts, milk, juice or yogurt. Our Organic Muesli is a perfect summertime breakfast- light, raw, and refreshing, yet filling at the same time. And if you like a warm bowl of oatmeal porridge in the colder months, muesli can be warmed in the microwave like oatmeal. 4 Wholesome Organic Ingredients. Pure and Simple. If you’ve eaten breakfast in Switzerland, Austria, or Germany, you may know muesli- an incredibly wholesome breakfast cereal consisting of oats soaked in milk or juice, dried or fresh fruit, nuts, and yogurt. In the early 1900s, “Bircher Muesli” was popularized by Swiss physician Maximilian Bircher-Benner. Also known as the “Sunlight” diet that encompassed healthy living and emphasized harmony between people and nature, the muesli was part of a raw diet that promoted healing. 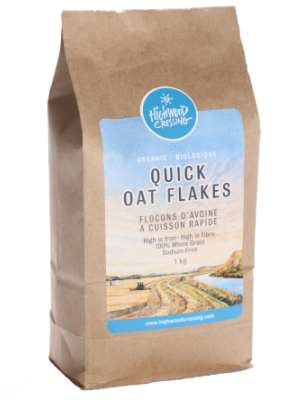 If you like eating raw foods but do not always feel full, this is a perfect breakfast because it satiates with a healthy dose of carbohydrates, protein and whole grain fibre. Muesli is definitely a breakfast for anyone who needs a lot of energy to get through the morning all the way to lunch. 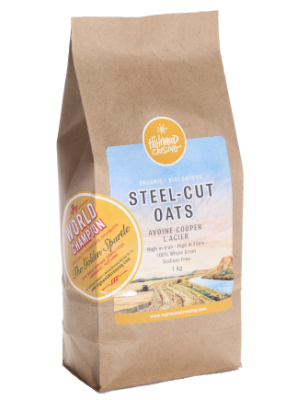 Each serving contains a powerful pack of whole grains, protein, and fibre. 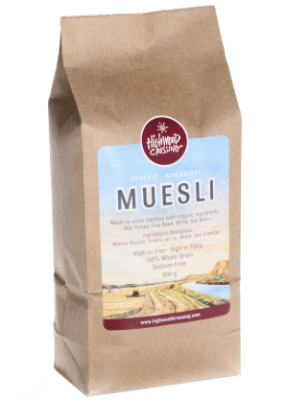 Our Muesli is also high in iron, sodium-free, with no artificial sweeteners or preservatives. All ingredients are certified organic and non-GMO. Made in a nut and peanut free environment with no traces of soy or dairy. As with all cereals, grains and flour, this Muesli should be stored in a cool, dry place. After opening the package, keep sealed in an airtight container and use within 1 year. Spoon cereal out of the bag to ensure contents are well mixed as the ingredients may settle. Mix, cover and soak overnight in the fridge or soak for half an hour in the morning before eating. Keeps for 2 days in the fridge. Soaking Highwood Crossing Organic Muesli in a liquid before eating aids in the digestion and the absorption of nutrients. The soaked flax seed, oats, oat bran and millet will absorb much of the liquid and create a pudding-like consistency. In the morning dress muesli up in your own unique way by topping with nuts, seeds, fruit, maple syrup or more yogurt – very versatile for individual preferences! If you have a busy morning or aren’t hungry first thing, layer muesli and toppings in a jar the night before and take with you to eat when you’re hungry. Incredibly fast and easy! 10 kg, 900 g, Case (9 x 900 g) – Free Shipping!